It’s day five of Soup Scentral! 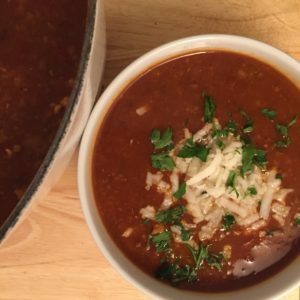 I shared some awesome recipes from my blog arsenal on day one, day two was Woman Crush Wednesday when I made a gorgeous vegetable soup from our fabulous honoree Katie Lee. Day three I shared a communal soup list from some of my fav bloggers. 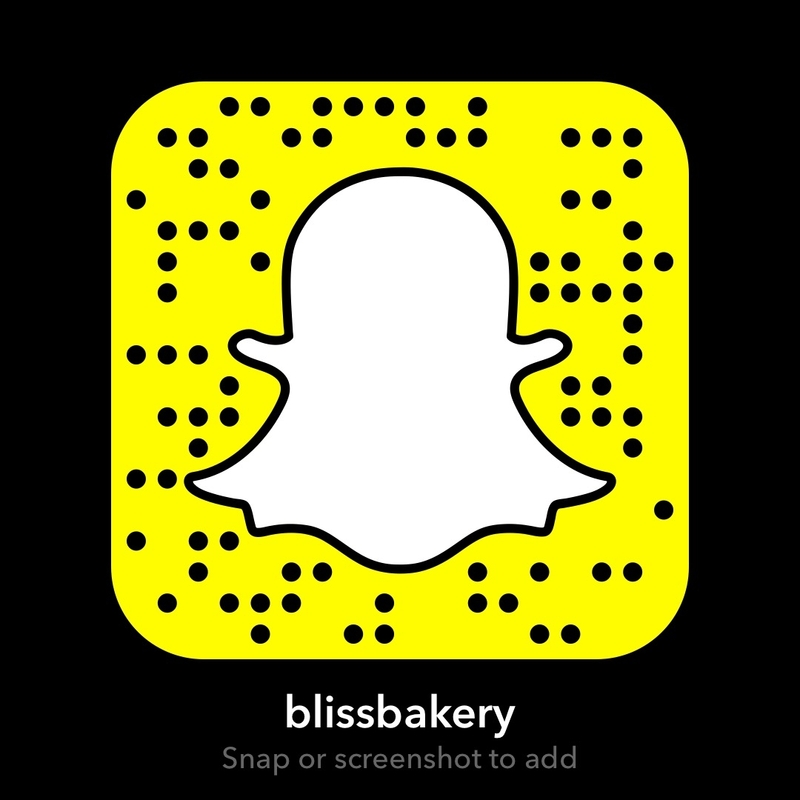 Yesterday, day four, I gave you a glimpse into a fresh food box service and a Vietnamese Soup Pho you. Today I am going to share a very special recipe. It is called Friendship Soup. There are varying interpretations of this recipe. I have seen a YouTube tutorial that isn’t so much about cooking in the kitchen, but more about life. It is actually adorable and worth a watch. When I was teaching preschool I incorporated culinary skills in my curriculum. Cooking with children teaches all sorts of concepts like math, chemistry and cooperation. In fact one day I did a lesson on friendship soup. 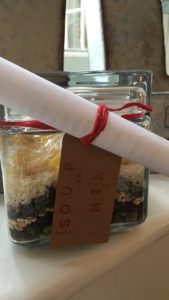 But in my version, I had all the kids bring in a different ingredient from home to see what kind of cooperative soup we would come up with. It was so fun and indeed a delicious concoction of veggies! 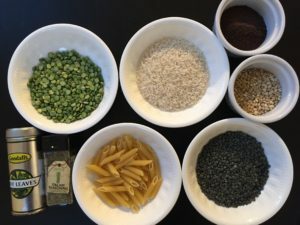 In a large glass jar, layer the split peas, bouillon, barley, lentils, Italian seasoning, rice, and bay leaves. Wrap the pasta in plastic wrap, and place in the jar. Seal tightly. 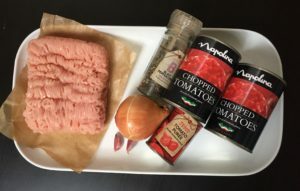 ADDITIONAL INGREDIENTS NEEDED: 1 pound (454 kg) ground/minced beef or turkey, 1 onion, 2 cloves of garlic, two 14 oz cans (two 400g tins) diced tomatoes – undrained, 1 (6 ounce) can (132 g tin) tomato paste (called puree in UK and Ireland), 3 quarts (liters) water and salt and pepper to taste. TO PREPARE SOUP: Remove pasta from top of jar, and set aside. Chop the onion and mince the garlic. In a large pot over medium heat, cook the ground/minced beef (if using turkey heat some oil in the pot first), Once cooked, remove to a plate; drain excess fat leaving a small bit. Add the onions and garlic and cook for several minutes until they have softened. Add back the cooked meat, the diced tomatoes, tomato paste, water, and soup mix. Bring to a boil, then reduce heat to low. Cover, and simmer for 45 minutes. Stir in the pasta, cover, and simmer 15 to 20 minutes, or until the pasta, peas, lentils and barley are tender. The thing is that this recipe is so good, you might want to buy double the quantity of everything and make a pot at home for your own family. But it really is a great concept to give someone a jar of weighed out ingredients and a recipe card handy for them. I would go so far as to buy the other ingredients for the soup and maybe some fresh bread when gifting to a family with a new baby. The best present for a new mommy is not having to worry about dinner for the rest of her family! And voila here we have the friendship soup all done and dusted! With the additional ingredients plus the soup mix this turns out so amazing, satisfying and a great all in one meal! Give this recipe a whirl, whether you are just making the mix for a gift or to keep on hand in your own pantry. Or indeed let me know if you make the full recipe from beginning to end as I have. This great year round hearty soup. It is delicious and also adaptable. If you are a vegetarian, just omit the ground beef and swap the beef bouillon for vegetable. Either way I hope you or your friend enjoy! 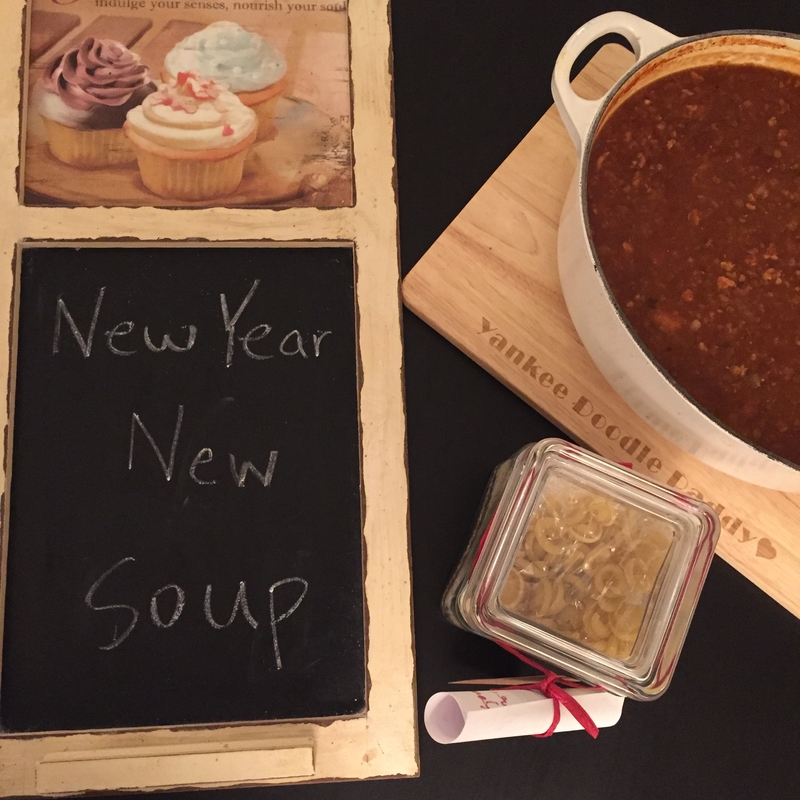 Instead of a New Year, New You…it can be a New Year, New Soup!